Gutters are an essential component of your home because they divert water away from the foundation of your house. Without gutters, your home will be susceptible to a variety of water damage scenarios. 1. Heavy Rainfall Too much rainfall can sometimes overwhelm and cause gutters to sag. Choose heavy-duty gutters and reinforce them to ensure they can withstand particularly heavy downpours. 2. Debris Buildup Because gutters are an exposed component of your home, it’s easy for various types of debris to get caught in your gutters. The problem starts when debris accumulates. 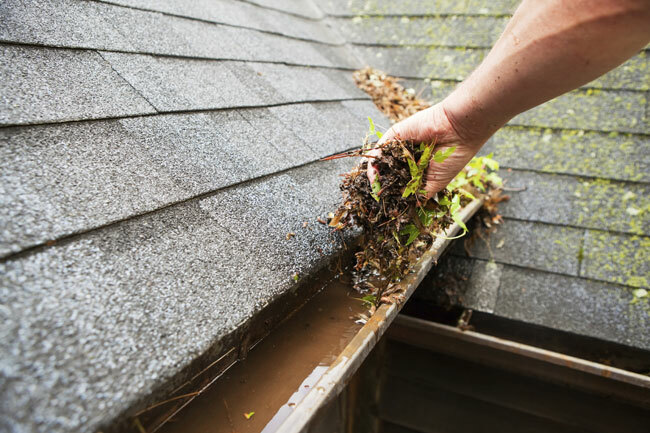 Debris buildup can lead to clogs and weight your gutters down, causing them to separate from your roof. You can add a leaf protection system to your existing gutters. We recommend the Leaf Terminator system. It protects against debris back up with a patented design to prevent leaves and debris from entering your gutters and clogging the gutter or downspout. 3. Undue Pressure Sometimes, the cause of sagging gutters is man-made. For instance, the mere act of placing a ladder on them can add undue pressure. Take extra care when working around your home to reduce the chances of sagging gutters. 4. Snow While snow usually melts and flow into gutters just like rain, there are some instances when snow doesn’t melt completely. Instead, it re-freezes in the gutters and can accumulate over multiple melt/refreeze cycles. Again, this makes for a constantly heavy load that your gutter system may not be able to bear. Whether you’re in need of a replacement roof, new gutters or a gutter leaf protection system, State Roofing is the name you can trust. Since 1968, we’ve installed over 60,000 projects. We serve various areas in Washington, including Bellevue, Everett, Snohomish, Olympia and Seattle, WA. Call us now at (360) 794-7164.